"I worry about access to the nuclear codes if he decided to do something, in a fit of pique, to tackle Kim Jong-un... 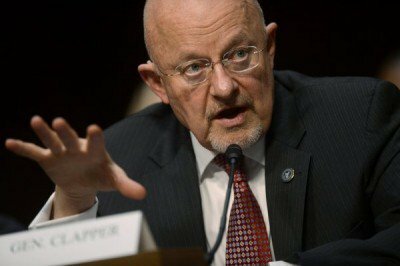 It's pretty damn scary," Clapper explained. 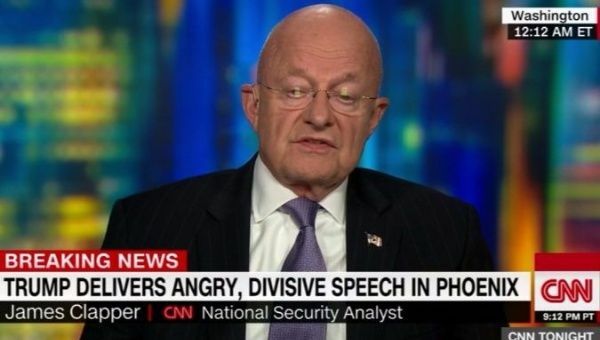 On Tuesday night, former U.S. director of national intelligence and retired Lieutenant General James Clapper openly questioned U.S. President Donald Trump‘s fitness to lead following his appearance at a rally in Phoenix, Arizona. “I question his fitness to be in this office and I also wonder if he is looking for a way out,” Clapper, who has served both Republican and Democratic administrations, said in a television appearance. “You know, I’ve toiled in one capacity or another for every president since and including John F. Kennedy through President Obama, and I don’t know when I’ve listened and watched something like this from a president that I’ve found more disturbing,” Clapper continued. The ex-intel head also commented that the U.S. president could be a threat to national security. “I worry about access to the nuclear codes if he decided to do something, in a fit of pique, to tackle Kim Jong-un… It’s pretty damn scary,” he explained. During the Phoenix address, Trump continued to defend the remarks he made, after an about face, regarding Charlottesville white supremacists, anti-racism group violent clash. The U.S. president continued to blame the “crooked media” for misrepresenting his response to the violence that resulting in the death of an anti-fascist protester. The president, in his second address, remarked that “many sides” were to be blamed for the clash between the two groups. Trump re-read the previous statements in response to the Charlottesville violence while in Phoenix, but pointedly omitted the controversial “many sides” remark. He said that he had “openly called for healing, unity and love” in his responses. At Tuesday’s campaign-style event, Trump rehashed many controversial topics, including the Charlottesville, North Korea and the U.S.-Mexico border wall. “He should have quit while he was ahead last night,” Clapper remarked, as he referred to Trump’s speech on Monday, which detailed his administration’s strategy for Afghanistan.